So guys, after a small vacation that I took which included going nowhere just relaxing at home and roaming the local markets, Im back with an article on the food that I had at Fratelli Fresh in Renaissance Hotel Mumbai. The chef at the restaurant has come up with a totally new menu which include his homestyle cooking that is based on simplicity and clean flavors. Like always, I would write alot about the menu and make you (my readers) read alot, but this time I have decided to try something different, i.e sticking to simplicity and to the point about the food and a short write up about the experience I had there. Before I get started, there is something I want you all to do, its a small request, you have to go and check out my facebook page - The Hungry Bawarchi, then my instagram account which is filled with majority food - HungryBawarchi and twitter account where I tweet about food and more - @HungryBawarchi. BTW, don't just visit, if you feel its good, like the page, and follow the other social media accounts. Now its time to describe the food in the best way I can. (please forgive me if I use some particular words repeatedly). 1. We started off with the traditional bread basket with some extra virgin olive oil and aged balsamic vinegar. a. Fritto Misto - Fried Squid, Fried Prawns served along with Basil Aioli and a simple yet flavorful Pomodoro sauce. To enjoy the dish even more, squeeze the lemon over the prawns and the squid and trust me you will enjoy it even more. b. Seared Scallops - Scallops wrapped in pancetta (just what one needs right ?) served along with a salad which to be honest was excellent and I did enjoy it more than the scallops (you must be thinking I am mad :P). The scallops were perfect cooked and seasoned and the dressing of the salad, I at don't remember things coz I get to engrossed into the food. 3. After the Anti-Pasti we wanted to take a small break and then move on to the next course but the chef being very nice to us, did not let us take that break and got us the Duck Ravioli from the pastas menu followed by the main course. c. The Duck Ravioli - Freshly made pasta, (it was made while we were eating the other stuff and I saw it as they have a show kitchen.) stuffed with minced duck stuffing served along with a brown mushroom sauce and some more mushrooms on top (I love mushrooms :P). The pasta was really thin and the stuffing was like just melting in the mouth. If you are a fan of duck, do give this one a try. d. 3 Mushroom Risotto - One of the traditional dishes of an italian cuisine is the risotto made with small grain rice, flavored with a particular ingredient for eg. mushroom here. The 3 types of mushrooms which went in the making of the dish were, Shitake mushroom, porcini mushroom powder which gave it the fragrance and the last one I can't recollect. The dish tasted really good, had that earthy flavor of mushrooms to it. Did get a little dry up as we waited for quite a long time before trying it out. e. Lamb Cutlet Provencale - Grilled lamb chops served along with creamy mash potatoes, sauteed vegetables and red wine reduction. The chef was so kind that without asking he got this dish made for us. Medium-Well done cutlets which were so simple yet flavorful. To be honest, after eating soo much we couldn't finish all 3 pieces on the plate. Last but something without which the meal is incomplete for 'The Hungry Bawarchi' is the desserts, I always have room for desserts. We were confused between three desserts and didn't know which to order, so just like how we all used to be in our childhood days, we played 'eni meni mini mo' and it worked :P.
We called in for the Tiramisu and the Vanilla Pannacotta. Sorry couldn't get the picture of the Tiramisu coz it was gone into the stomach as soon as it arrived. So you can guess how nice it was. 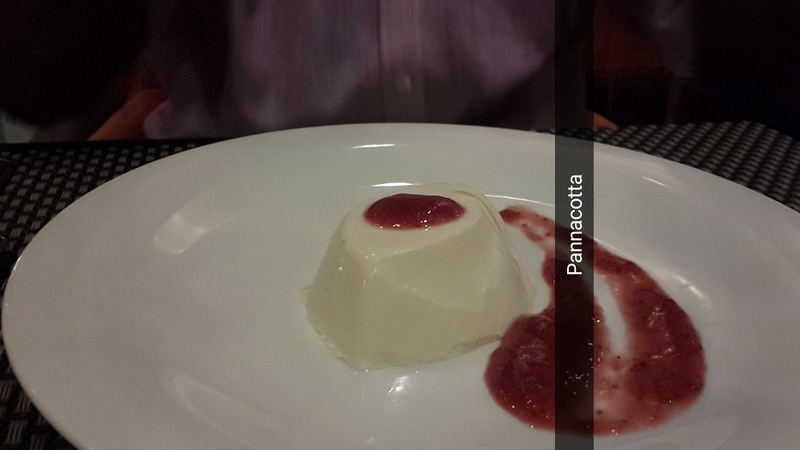 But for the Pannacotta, somehow I wasn't impressed with it. It was set way too hard for a pannacotta and flavor wise it was lacking the vanilla bit to it. You can give this a skip. 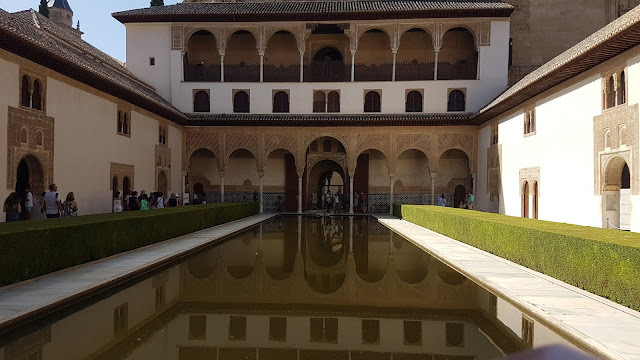 I know I had said that it will be short but I couldn't resist writing about the food and the whole experience. Overall I did enjoy the night and I don't regret the calories that I put on after eating all that. But guys this is definitely a place that you should try out and do not forget to the meet the chef, he is really nice and friendly to chat with.